1. The Scenery – The Amalfi Coast is spectacular. As soon as your guests see the incredible views, they will fall in love with the coast. The rugged shoreline with homes and hotels precariously clinging to the cliffs is an incredible view. 2. The Weather – While the winter months tend to be somewhat cooler and quite cloudy, the spring, summer and autumn are just perfect. Warm days and cool evenings make for a perfect holiday destination. 4. The Hospitality – While our days are warm, our people are even warmer. Enjoy southern Italian hospitality at its finest here. 5. The Food – from soft-ball sized lemons to the bounty of the sea to the delights of San Marzano tomatoes to freshly made mozzarella, the Amalfi Coast has it all. Come for a taste of our coast – you will never forget it. 6. Many fun activities – There is so much to see and do on the Amalfi Coast. Keep your guests constantly busy – or busy doing nothing. The “Dolce far niente” is alive and well on the coast. Visit the many small towns and watch the artisans at work or sit on a beach and watch the sea gulls playing in the waves… the choice is yours. 7. The Venues – Are you looking for the perfect venue for your wedding? A 15th century tower?…a 11th century vaulted arsenal? …a renaissance secret garden? ….a patio overlooking the sea? The Amalfi Coast has it all and more. 8. Easy Access – Travel can sometimes be tough. With Naples airport only an hour away, the Amalfi Coast is in an ideal location – far enough from the city to be exclusive – yet close enough to reap all the benefits. 9. 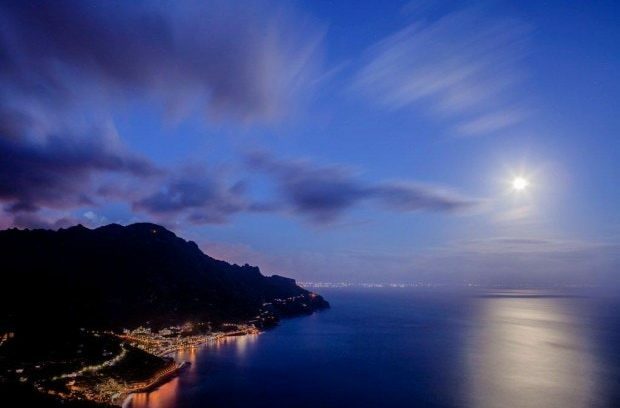 The Amalfi Coast is a perfect honeymoon location with magnificent hotels dotting the coastline – or you can make it the ideal starting point for travel all over Italy with high speed trains departing all day long from Salerno. 10. The Amalfi Coast offers romance for private elopements – and incredible hospitality for large weddings. Large or small, the coast makes a perfect wedding venue.